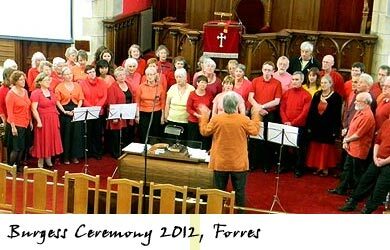 We are a mixed Community Choir, based in Moray since January 2004. 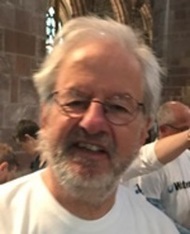 We sing inspirational songs from around the world: African, East European, Gaelic, Welsh, World Music, Taizé, traditional, contemporary, and many more. We offer a safe atmosphere to discover and develop your natural singing voice. We are open to everyone, no auditions. No musical experience necessary, learning by ear. The choir perform a concert every other year, and enjoy appearing at Community Festivals. In Spring 2005, 25 members made a first Choir Trip to Iona where we sang in the Abbey. This grew into a yearly tradition during October school holidays. In 2010 and 2011 we were closer to home, near Carrbridge. > Video “Singabahambayo Thina” (On Earth an army is marching). 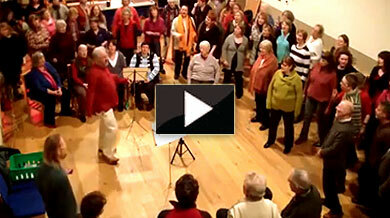 Bill Henderson leads this South African freedom song that has been in the community choir repertoire for many years. 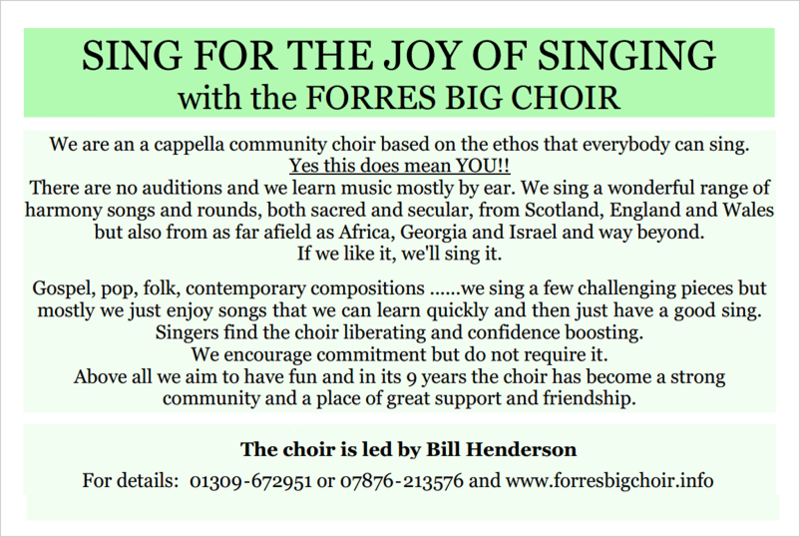 Part of the Forres Big Choir 10th birthday Big Sing, 15 January 2014. The Forres Big Choir is a total delight and at least in part compensated me for saying a sad goodbye to the choir I led in Wales. A place of empowerment and self-discovery.